← WHOSE PHOTO DO YOU THINK THIS IS ?? SOMEONE YOU KNOW ?? THE TIDE OF THE LIFE OF THE CHURCH IS CHANGING. WHETHER IT IS RISING OR FALLING DEPENDS ON ONE’S POINT OF VIEW. FROM WHERE I STAND IT IS RISING, AS THIS POST GIVES EVIDENCE THAT IT IS. An anxious Easter, at the top of the Catholic Church. Over the span of a few days, two of the most revolutionary turning points of the pontificate of Pope Francis have been contested with as many public declarations on the part of cardinals, bishops, and members of the Christian people. They are the two watersheds that admit to Eucharistic communion both the divorced and remarried, and Protestants. With regard to communion for the divorced and remarried, already in 2016 four cardinals had spoken out against the “openness” of Francis, submitting to him their “dubia” and then asking him by letterto be received. Without ever getting any response from him. But now two of those cardinals, the German Walter Brandmüller and the American Raymond L. Burke, have again come forward and together with all the participants in a conference held in Rome today, Saturday April 7, have published a “Declaratio,” a profession of faith, which reaffirms the key points of Church doctrine brought into doubt by the onslaught of innovation begun by the current pontificate. The text of the “Declaratio,” in multiple languages, is presented on this same page, further below. As for communion for Protestants at Catholic Masses, seven bishops of Germany, including the cardinal of Cologne, Rainer Maria Voelki, have made an appeal to the Holy See against the decision to allow it, made by the German episcopal conference. This decision – which is presented in the form of an “orientational aid” – went into effect on March 22 at the end of a meeting of the episcopal conference, where it had been approved by a majority vote after a lively discussion. The bishops who contested this decision maintain that it touches on a question that is too significant, one that endangers the doctrine and unity of the Catholic Church, to be left to the judgment of individual national Churches or individual bishops or priests. And precisely for this reason they have made an appeal to Rome, asking for a clarification from the congregation for the doctrine of the faith, which has as its prefect the Jesuit archbishop Luis Ladaria, and from the pontifical council for Christian unity, which has as its president Cardinal Kurt Koch. Their initiative was covered in the April 4 edition of the German newspaper “Kölner Stadt-Anzeiger.” The seven signers of the appeal, in addition to Cardinal Woelki, are Ludwig Schick, archbishop of Bamberg, Konrad Zdarsa, bishop of Augsburg, Gregor Maria Hanke, bishop of Eichstätt, Stefan Oster, bishop of Passau, Rudolf Voderholzer, bishop of Regensburg, and Wolfgang Ipolt, bishop of Görlitz. Whether the Holy See will respond or not, and how, will naturally depend on what Pope Francis will decide. But if a response comes from Rome on this question, it will appear even less justifiable that the pope has kept such a stubborn silence concerning the “dubia” on the other crucial question of communion for the divorced and remarried, this too concerning the Catholic doctrine of the Eucharist, “source and summit” of the Church’s life. The speakers were cardinals Brandmüller, Burke, and, from Hong Kong, Joseph Zen Zekiun, Bishop Athanasius Schneider, the philosopher and former president of the Italian senate Marcello Pera, the canonist Valerio Gigliotti, the bioethicist Renzo Puccetti. There was a replay of a talk given by Cardinal Caffarra in defense of the encyclical of Paul VI “Humanae Vitae,” now under reconsideration. And Cardinal Burke also raised his critical voice in an extensive interview published just before the conference on La Nuova Bussola Quotidiana and in English on LifeSite News. Newman published this text anonymously in the English Catholic magazine “The Rambler,” of which he had been the editor. At the time it raised heated controversy. It was republished in 1961 just before Vatican Council II and since then has become a classic. In it Newman reviews the moments of the Church’s history in which the orthodoxy of the faith was lost by many of the bishops and saved instead by many of the ordinary baptized. 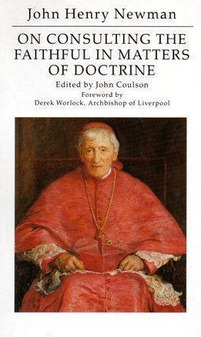 And he gathers from this that on matters of doctrine listening to the voice of the faithful – not to be confused with public opinion, but to be verified in its fidelity to the tradition of the Church – is not only desirable, but a duty. A lesson of history more valid now than ever, and one to which the “Declaratio” gives voice. In the hope that it may be heeded even by him who sits on the chair of Peter. Due to contradictory interpretations of the Apostolic Exhortation “Amoris laetitia,” growing discontent and confusion are spreading among the faithful throughout the world. The urgent request for a clarification submitted to the Holy Father by approximately one million faithful, more than 250 scholars and several cardinals, has received no response. Amidst the grave danger to the faith and unity of the Church that has arisen, we baptized and confirmed members of the People of God are called to reaffirm our Catholic faith. Blessed John Henry Newman also encourages us to do so. In his prophetic essay “On Consulting the Faithful in Matters of Doctrine” (1859), he spoke of the importance of the laity bearing witness to the faith. 1) A ratified and consummated marriage between two baptized persons can be dissolved only by death. 2) Therefore, Christians united by a valid marriage who join themselves to another person while their spouse is still alive commit the grave sin of adultery. 3) We are convinced that there exist absolute moral commandments which oblige always and without exception. 4) We are also convinced that no subjective judgment of conscience can make an intrinsically evil act good and licit. 5) We are convinced that judgment about the possibility of administering sacramental absolution is not based on the imputability of the sin committed, but on the penitent’s intention to abandon a way of life that is contrary to the divine commandments. 6) We are convinced that persons who are divorced and civilly remarried, and who are unwilling to live in continence, are living in a situation that is objectively contrary to the law of God, and therefore cannot receive Eucharistic Communion. Our Lord Jesus Christ says: “If you continue in my word, you are truly my disciples, and you will know the truth, and the truth will make you free” (Jn 8: 31-32). With this confidence we confess our faith before the supreme pastor and teacher of the Church and before the bishops, and we ask them to confirm us in the faith. 1 Response to THE TIDE OF THE LIFE OF THE CHURCH IS CHANGING. WHETHER IT IS RISING OR FALLING DEPENDS ON ONE’S POINT OF VIEW. FROM WHERE I STAND IT IS RISING, AS THIS POST GIVES EVIDENCE THAT IT IS.